When you think of a seal, you might think of the animals that perform tricks at water amusement parks, but these animals are usually sea lions, not seals. Sea lions have large front flippers which help them get around on land, while seals are slow and awkward. Seals are definitely made for swimming! All About Seals: There are more than 30 species of seals living in many parts of the world. There are more than 30 species of seals living in many parts of the world. 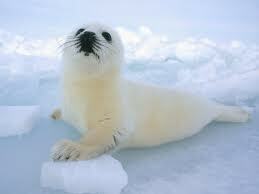 Seals eat fish, birds and shellfish and most of them live in cold water where fish are plentiful. The Caspian seal is the world’s smallest seal, weighing as much as an adult woman (110 to 190 pounds). Elephant seals, the world’s largest seal, measure 20 feet long and can weigh as much as 8,800 pounds! The Caspian seal is the world’s smallest seal, weighing as much as an adult woman (110 to 190 pounds). Some seals migrate hundreds of miles every year in search of food. Seals can dive to great depths underwater and stay there for up to two hours. Seals use clicking or trilling noises to communicate. Male seals are called bulls; females are called cows; babies are called pups. Seals have a thick layer of fat called blubber under their skin to keep them warm in icy water. 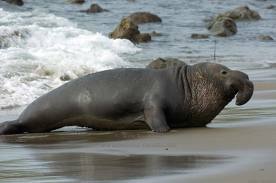 Elephant seals, the world’s largest seal, measure 20 feet long and can weigh as much as 8,800 pounds! A video documentary of seals defending their territory. Question: Do seals live on land? Answer: Seals come on land to rest, mate and take care of new babies. Question: Do mother seals give birth alone? Answer: Most seal mothers gather together to give birth on beaches. Mom uses her sense of smell to find her baby in the hundreds of other babies on the beach. Enjoyed the Easy Science for Kids Website all about Seals info? Take the FREE & fun Seals quiz and download FREE Seals worksheet for kids. For lengthy info click here. Declan, Tobin. " Seal Fun Facts for Kids ." Easy Science for Kids, Apr 2019. Web. 25 Apr 2019. < https://easyscienceforkids.com/all-about-seals/ >.